King Street Theatre till May 24. Buy Tickets here. I saw Irvine Welsh at the Adelaide writers festival a few years back. He is an engaging speaker with a warm, generous personality, who puts up a convincing show of modesty. Among his many witty anecdotes was a consideration of the irony that much of his time is spent with Chuck Palahniuk on a semi-permanent “cult novel” tour of the United States, perpetually populated by mostly angry young men going through similar stages to the protagonists of the two novels made (in)famous by the film versions of the books. It’s a very pedestrian tale, and one the characters of neither novel would approve of, but that is the underlying point of Trainspotting – that the choice between conformity to society and living rebelliously on the margins is always one of self-destruction. When neo-conservatism came to the UK in the 70’s it inadvertently forged the punk movement, whose roots were anti-conformist. Like all counter-culture determined to make a “splash” it became replete with its own rules so that the phrase “punk is the non-conformists uniform” is more than a joke, but worse, the counter-culture becomes the shadow of conservatism, ultimately as conservative as the culture it seeks to subvert. Beliefs such as open misogyny, self-destruction, hedonism and a refusal of morality need their opposites to fight against, although the argument could successfully be made that none of these actions make you anti-establishment. Yet, despite all this, Bob Dole famously made the accusations that Trainspotting makes “depravity” appealing, and this Irvine Welsh fan can’t help agree – not that I think there is anything wrong with that, however. I do think no choice has been made about one’s life unless you have really visited a moment in the alternative, and surely this is what art is for? There is no point claiming moral superiority over drug abstinence if you’ve never been interested, attracted to or indulged in the romance of the idea, for just a couple of days, through music, literature or theatre. Perhaps this is the real value in counter-culture, that there is a place to visit to test the options and make strong decisions about life? Bob Dole seems to have a propensity for drug use, otherwise how could he know to be afraid? Desire is always something we want and don’t want at the same time, always manufactured and almost always refused. When I watch or read Trainspotting, I wonder which aspect Bob Dole wanted more; going elbow deep into a slimy un-flushing toilet, or the dead baby? Trainspotting achieves what all great works of counter-culture achieve. It shows both sides of the agony of moral refusal, something it claims right from the start. “Smack,” says Mark Renton, “Is an honest drug, because it strips away the delusions. With smack, when you feel good you feel immortal. When you feel bad – you see the misery of the world as it really is. real life…” Perhaps Bob Dole is mostly afraid we’ll see real life, the negative side of heroin than the positive? Perhaps this is what he is afraid we will be most attracted to? Before Trainspotting was a film by Danny Boyle and the possession of all of us, it was a successful piece of theatre. 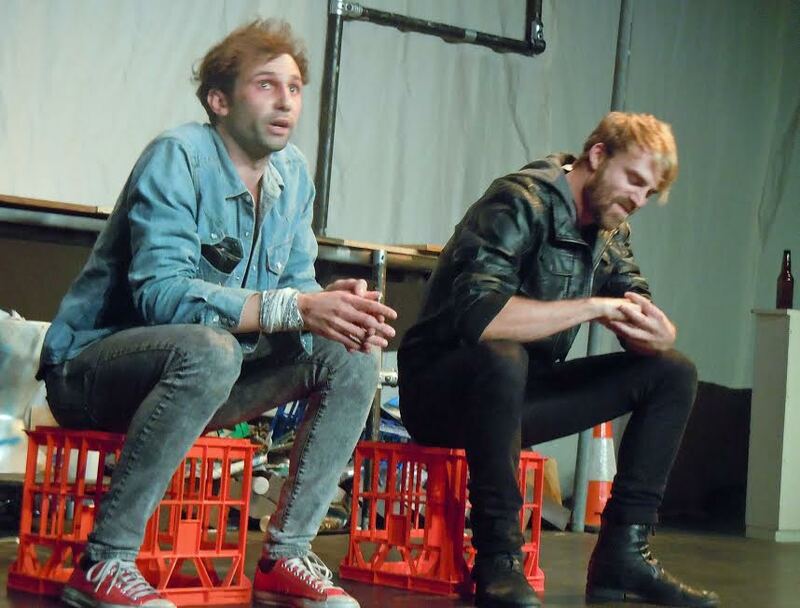 The books short stories made the move to theatre natural for the adaption by Harry Gibson. Proving that Trainspotting has lost none of its punch all these years later (we still live under neo-conservatism after all, we’ve just gotten better at accepting it) there is still a great pleasure to be had in dipping into the lives of Welsh’s anti-heroes for a little visit to the dark side of our chosen existence. 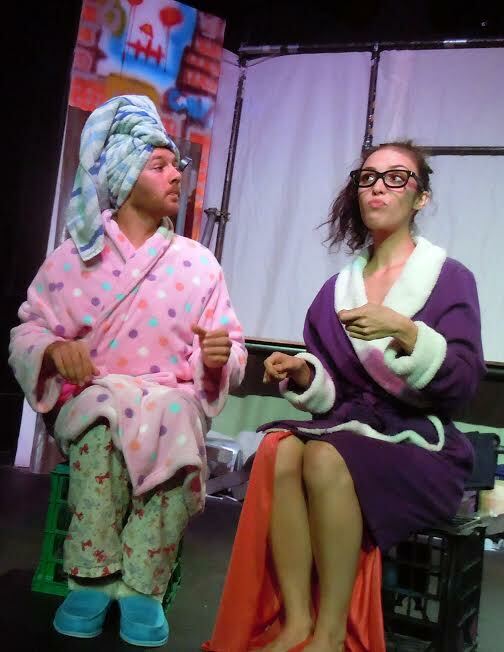 Black Box theatre and Emu Productions have put together a mighty show, wonderfully performed and directed with so much vitality the spirit of, not just the book, but the movement thrives through each vignette. 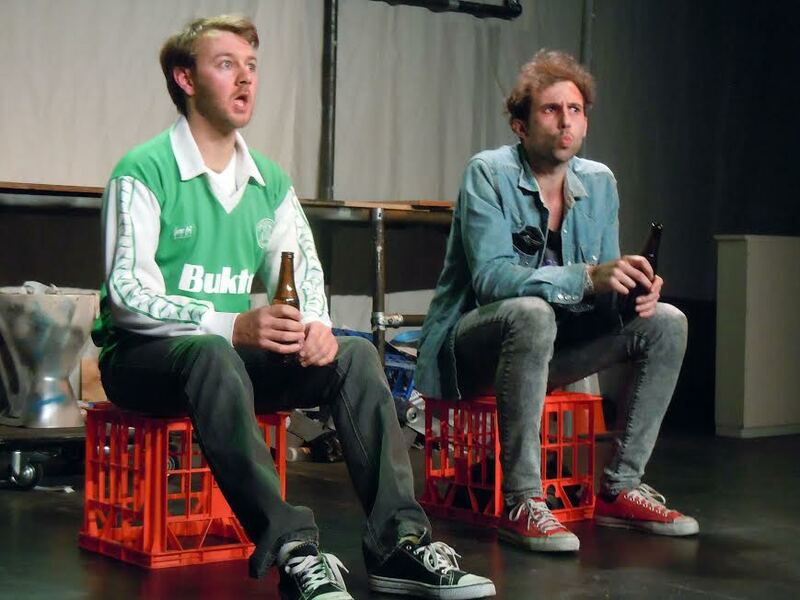 The entire cast is performed by Damien Carr as Renton, Brendon Taylor and Leigh Scully as the various other friends and Taylor Beadle-Williams taking several for the team as all the long-suffering women associated with this movement strangely forced to live with a deeply conservative misogyny (strangely, as does the so called Rap culture today that seems to imagine misogyny is subversive). Everyone is right on target, Scottish accents are consistently strong, the flitting in and out of alternate characters fluid and clear, the direction and performances speaking to the universals rather than focusing on Welsh’s specifics of Scottish politics. This small cast performing so many roles turns out to offer its own new and interesting take on something we may presume to know, in that a certain sort of amalgamating effect takes place as the effects of lifestyle turn everyone into everyone else, when the purpose was always to be different. There are perspectives offered under Luke Berman’s direction that can only come forward in theatre, and the success of the play shows just how well Irving Welsh’s tale is written. The set is versatile and eloquent in the way it offers up props out of its obvious sludge, again a perspective Luke Berman has been able to glean from the stage that other mediums couldn’t produce. A lot of thought and time has gone into this excellent, vibrant production and it shows. Trainspotting may not always be the easiest night at the theatre – sometimes it’s horrifying enough to discover what you think is funny – but this is a true commitment to the tone of the original novel and the spirit of a movement that captured something elusive and potent that still tugs at societies underbelly today.